Opponent: Dr Antonello Alici, Università Politecnica delle Marche. Custos: Professor Kimmo Lapintie Aalto University School of Arts, Design and Architecture, Department of Architecture. Opponent: Pille Pruulmann-Vengerfeldt, Associate Professor, University of Tartu. Custos: Professor Merja Salo, Aalto University School of Arts, Design and Architecture, Department of Media. This entry was posted in Seminars on January 27, 2016 by Helinä Kuusela. This entry was posted in Seminars on January 26, 2016 by Helinä Kuusela. The themes of previous conferences range from intersections between arts and research to addressing what is considered artistic or arts-based research. The gatherings have helped develop vocabulary and concepts of arts-based and artistic research for researchers and students from all over the globe, and created a community of scholars interested in artistic or arts-based research and writing. This entry was posted in Seminars on January 19, 2016 by Helinä Kuusela. A promising approach, known as End-User Development, empowers end users to define and tailor the functions of their systems in order to satisfy their personal, local, and often task-specific needs. 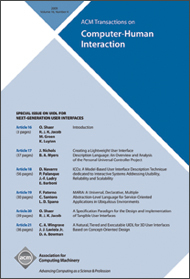 In the context of the Internet of Things, and the diverse tools and methodologies now available to support the design of interactive systems, the field of End-User Development finds itself at a critical juncture of growth and wide impact, as the need to support personal, context specific, and emergent needs largely exceeds what is known from more conventional interactive systems. CONTACT: Contact the special issue editors at eud-for-iot@TOCHI.acm.org with any questions. This entry was posted in Seminars on January 7, 2016 by Helinä Kuusela.